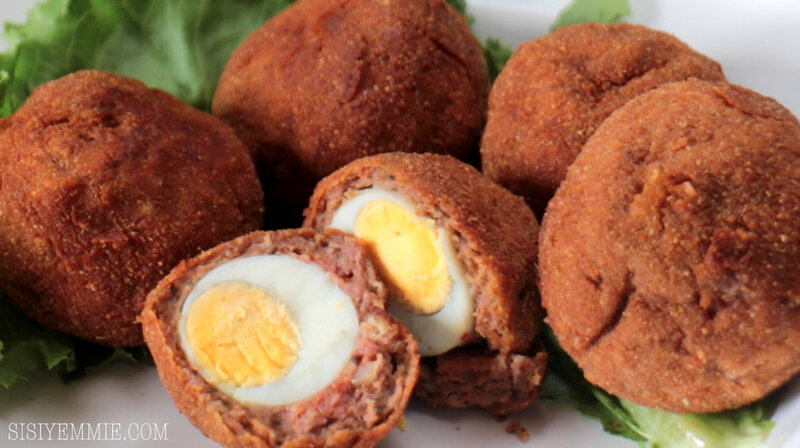 I'm not such a big fan of scotch eggs but Bobo loves it and he would ALWAYS buy whenever he goes to a fast-food. Then he would end up complaining that the sausage is not enough and always thin...so I figured, it's time to start giving him home-made scotch eggs with all the sausage filling he wants! Everybody is happy!As usual I have the video for this recipe below, make sure you SUBSCRIBE so you get all my recipes as e dey hot! Boil your eggs till they are hard (I prefer working with hard boiled eggs), break another egg into a small bowl, that will be your wash for later. Combine your sausage with all the spices and mix properly. In other small bowl add your flour, and in the third bowl add your bread crumbs. You should have a station of the egg wash, flour and bread crumb (see video below). Peel your eggs and pat dry with a paper towel. Taking a spoonful of sausage beef, place on your cling film, and flatten. Next roll the egg in plain flour, place it in the middle of your flattened sausage. Using the sausage as covering, form a ball until the entire egg is covered. Transfer the sausage and egg roll into flour and coat. Next put it in the egg wash and roll. Then place it in the bread crumbs and coat it entirely. In a deep pan, add enough oil to deep fry your scotch egg, when it is hot, place the scotch egg in the oil. If the oil is too hot, the insides will not cook but outside will be burnt. If the heat is not enough your scotch egg will soak in oil. Allow to fry for about 5 minutes on each side, while frequently turning. This looks and sounds extremely good. Well done!Hope to try it some day. This looks yummy already. I like the twist to the traditional Scotch egg, it's brilliant. Thanks for sharing. I hope to try this. I usually buy it from the shops but I guess the homemade ones would be more fresh. That look so yummy! I am definitely going to make this. Thanks for this wonderful video! Thanks for this lovely tip. Please how do I get the suya sausage? I know of the regular sausage but I've not heard suya sausage before now. I tried this but the egg keeps popping out when I fry. SEXUALLY ABUSED AT 6 YEAR OLD! 4 THINGS TO DO TO MAKE YOUR BLOG POP! BUKA STEW- OBE EJA KIKA! SELL YOUR UNWANTED BABY ITEMS & GET CASH!!! LIFE IN LAGOS : SISI WEEKLY EP #49 "SURPRISE!"